Equipment affected: Spectrum and Prism Prime with engraver software 2.3.0.12 or higher, and Collage version 4.3.29 or higher. Sequence engraving, also called Over Engraving, is used to engrave two or more separations on the same cylinder. This is easily done by setting up the image correctly in the design system, and then setting the parameters in the Collage job. The engraver will then automatically engrave the first separation then reposition the head to engrave the second separation on the same cylinder. Note: In Gravure Parameters, Color Sequence page, "Cylinder ID" field is now called "Cylinder ID (Over Eng.)." Set up the artwork that will engrave on the same cylinder as two separations. For example, if the image has Process Black and Linework Black, then there should be two black separations. 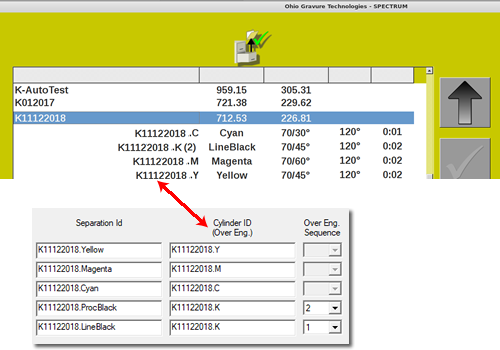 On the Gravure Parameters Color Sequence page, make sure that the colors to be engraved on the same cylinder come in as different separations. In this example (Job ID is K11122018), there are 5 separations with two black separations. In the Cylinder ID (Over Eng.) fields, change the names of the two separations to be the same. In this example, both are changed to K11122018.K. The Over Eng. Sequence drop-down becomes active after you tab out of the last field. In the Over Eng. Sequence drop-down, check the number for each separation. The separation labeled “1” will engrave first and the separation labeled “2” will engrave second. If you want to change the engrave order, use the drop-down. Typically the order is to engrave the Linework first and then the process. In the Job List window, select the Job ID folder to see all separations in the job (the same name as the Over Eng. Group field). When there is an Over Eng. Sequence, only one separation displays. After the name see a parentheses with the number of separations (images) to be engraved on the same cylinder. The name of the separation marked "1" in Collage displays. In the example, that is "LineBlack." In the example, Job ID K11122018, the 2 black separations will be engraved on the same cylinder. * The unengraved separations in the job are listed here. Usually the name from the Separation ID field is listed, but it may be the name from the Cylinder ID (Over Eng.) field, depending on how your engraver is configured. See Engraver Config below. When the cylinder is selected, all separations in the Over Eng. Sequence are downloaded together. The engraver will automatically engrave the first separation (labeled “1” in Collage), then reposition the head and engrave the second separation. On the Config page, go to the Job tab. Scroll to find Cylinder Identification. 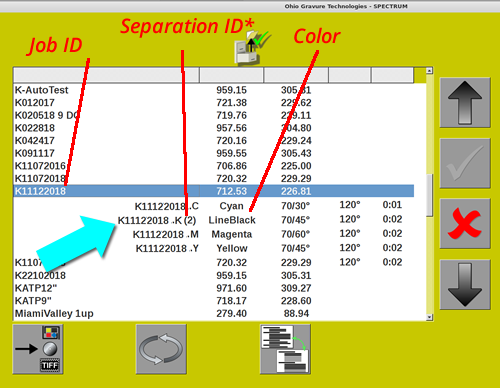 Select either Separation ID or Cylinder ID. Example: The engraver is configure to show the Cylinder ID name in the Job List. The Over Engrave Sequence can have more than 2 cylinders. As long as the names are identical, the separations will engrave on the same cylinder, one after another, in the order set in the Over Eng. Sequence drop-down. Please see the Collage on-line Help for detailed information. Sequence Engraving works on Spectrum or Prism engravers, or on Hell engravers when Collage has the Hell Output module.